With this device you can not only program all the devices in your system, you can have them appear on a protected web site. That means it will run on any smart phone too, not just the iPhone. From your cell phone you can program your Insteon house devices from your office, the bus or from Moscow. That's almost 6 for 6 on the Geek-o-Meter. So, sure, you can turn your lights on and off from a hundred miles away but what practical use is that? 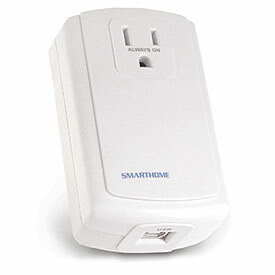 Almost none, but Insteon devices aren't limited to light switches. You can also use it to control air conditioners, boilers, your DVR, the irrigation for your tomato plants, video cameras, the coffee pot and in fact control anything that works with an IR remote. So I could (if I had kids), log into my password-protected web server, turn on some lights and watch the rug rats over net video. Or override the setback timer on my thermostat if I have to work late. Or reboot my servers. I'll probably never use it for that but it's fun knowing that I could. One thing I do love about Insteon timers is that my "house" knows the time of day and my latitude and longitude so it takes care of turning on and off the lights for me. I didn't realize how dependent I was on that until my PowerLinc failed, I looked out of my office door one night and saw that the house was completely dark. The next morning, I found the garage and basement lights still burning. I was used to having Houselinc do a precautionary kill of those lights every evening at midnight. When the ISY99-i gets here I'll post more about it, including I'm sure a good dose of complaining. I wonder if this will work with my old flaky x10 system? I'm tired of lights randomly turning themselves off an on. There some Insteon to X10 related posts on the site. For X10, there are some automation ideas here. 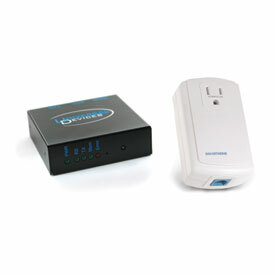 Insteon devices are faster, better constructed and more reliable that X10. Even though I had a failure with a device here, that's the first one. In the same time I would have replaced at least four X10 devices by now. Even better, Insteon also does X10 so you can start replacing defective X10 devices with Insteon now. I still have a half dozen X10 devices in the house which Insteon handles fine. A relatively inexpensive home automation controller that runs from a smart phone. The home automation layout, which was decidedly more hobbyist-friendly than Insteon but decidedly more flaky. Ain't technology grand until it melts down! I wish we had put more automation in our new home but the budget fixed that! The only thing we ended up with was some radio controlled switches so we can turn on lights from the car. I've also got a bunch of accent lighting in the house which I tend to forget to turn off at night. Maybe I'm only saving fifteen bucks a month having Insteon kill those lights after midnight but at the end of the year that's three or four Insteon devices paid for. Security is another feature. Next to my bed is a scene controller that lets me turn on/off groups of lights in the house. During a recent rash of house burglaries in the neighborhood, it came in handy when I heard a noise in the middle of the night or the dogs suddenly went into alert mode. The "ALL ON" button turns on every Insteon lighting device in the house, including all the outside lights. Instant ball park.